Going into Wednesday’s afternoon rubber match vs. the up and down Mariners, the Orioles were looking to emerge from their nine game road trip out West with a winning record. The Orioles threw out Kevin Gausman after going three up, three down in the first inning to try and silent the Mariners’ bats; after striking out the side to strand a runner on second base, Gausman looked poised to lead the Orioles to a victory at Safeco Field that could of won the series. Of course, assuming that the Orioles had not already packed up their bats home to Baltimore. 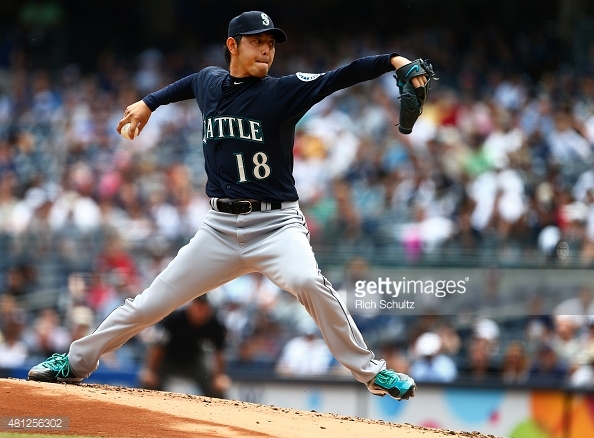 Throughout the entire sequence of strikeouts, weak comebackers, and lazy popups, one man was dominant: Hisashi Iwakuma. Coming into today, the Tokyo-born right hander has had excellent success in the MLB and his record in the majors is 40 wins and 22 losses. Iwakuma has never pitched a complete game at the MLB level. Consider that streak an afterthought. Locating his pitches to perfection, Iwakuma subdued the Orioles through a no-hit shutout, the only mistakes were walks to Manny Machado, Jonathan Schoop and Chris Davis. Iwakuma had his way with the Orioles hitters, painting the black on both sides of the plate and hitting his spots consistently and thoroughly. Catcher Jesús Sucre called this masterpiece. Kevin Gausman tried to keep his team in the game, only giving up 3 runs over 7 innings of work, but the command of Iwakuma won the day. Iwakuma Struck out 7 Orioles to go along with his legendary work. One might argue that Buck Showalter did not do the Orioles any favors with his questionable lineup; he inserted light hitting left fielder David Lough, shortstop Ryan Flaherty, and designated hitter Jimmy Paredes. Those 3 players were a combined 0 for their last 80 coming into today’s game…they didn’t hit today, either. JJ Hardy is still out with a back injury that has been bothering him all season. Losing Hardy hurts. Hardy is a way better option than Flaherty. This result to end the road trip has to leave many Orioles fans wondering. If the Orioles could of came out of the wild wild west with a winning record it could of been a huge boost in confidence to propel them through the upcoming homestand. Nevertheless, the Orioles remain in the hunt for both the AL East division crown and the second wild card spot. It will be critical for the Orioles to bounce back in a strong way on Friday against the Mets, both for their playoff hopes and their own sanity. Next Post Redskins Tight Ends: Where Did They Go?